(21412.BH.1247, Z. P. Meyers/Barney Hillerman Photographic Collection, OHS). (7195, Spencer Hilton Collection, OHS). As the Oklahoma state capital and the county seat of Oklahoma County, Oklahoma City is centrally located within the state and is a major crossroads served by Interstate Highways 35, 40, 44, 235, and 240. The future Oklahoma City lay within an area that was formerly part of the Creek and Seminole nations in Indian Territory. In the 1870s and 1880s Montford T. Johnson, a contemporary of Jesse Chisholm, operated a ranch at Council Grove, in present western Oklahoma City. Oklahoma City sprang into existence on April 22, 1889, when approximately fifty thousand participants of the Land Run of 1889 claimed town lots and quarter sections in the area known as the Unassigned Lands. On that date an estimated four to six thousand settlers came to Oklahoma Station (later Oklahoma City) to establish homes and businesses. Prior to the land opening the Southern Kansas Railway (later the Atchison, Topeka and Santa Fe Railway) built a line from the Kansas-Oklahoma border to Purcell, Indian Territory. At the North Canadian River a watering stop along that line, known as Oklahoma Station, was established in February 1887. A post office at Oklahoma Station opened on December 30, 1887. The post office was renamed Oklahoma on December 18, 1888, and finally, Oklahoma City on July 1, 1923. On April 19, 1889, three days prior to the land opening, Sidney Clarke, William L. Couch, and others formed the Seminole Town and Improvement Company in Topeka, Kansas. Two other townsite companies competed with the Seminole group in platting Oklahoma City. Consequently, accusations were made that some individuals were Sooners and lot jumpers and general confusion ensued. From April 22, 1889, to May 2, 1890, the towns and communities in the Unassigned Lands existed under provisional government because the federal government had not foreseen the need to establish laws to govern the new territory. When the U.S. Congress passed the Organic Act on May 2, 1890, the laws of Nebraska applied to the newly formed Oklahoma Territory until local legislation could be passed. Oklahoma City was incorporated on July 15, 1890. William L. Couch served as the first provisional mayor of Oklahoma City and Charles F. Colcord as the first police chief. When Couch resigned on November 11, 1889, Sidney Clarke became acting mayor until an election could be held. Andrew J. Beale was elected mayor on November 27, 1889. In 1890 William J. Gault became the first nonprovisional mayor. With the passage of the Organic Act seven counties were established. Oklahoma County was originally known as County Two, with Oklahoma City as the county seat, and Guthrie was designated as the territorial capital. Rivalry between Guthrie and Oklahoma City for the capital existed until June 11, 1910. By a majority vote of the people on that date, Oklahoma City was selected as the state capital, and the state seal was moved from Guthrie to Oklahoma City. William F. Harn and John J. Culbertson donated land for the capitol site. Ground-breaking for the capitol occurred on July 20, 1914, and the structure was completed on June 30, 1917. The Oklahoma State Capitol (listed in the National Register of Historic Places, NR 76001572) was built without a dome due to lack of funds as the United States entered World War I. However, on June 20, 2001, construction started on a dome, which was dedicated on November 16, 2002. In June 2002 The Guardian statue was placed atop the dome. From 1889 to the 1910s city leaders and builders turned the railroad watering stop into a bustling commercial and transportation hub. Henry Overholser, a prominent early settler, had six prefabricated, two-story, wooden buildings transported to Oklahoma City in the early months of its development. He built the first opera house and constructed a palatial home, the Overholser House (NR 70000536), on the outskirts of town. Overholser and Charles G. "Gristmill" Jones, who established the first flour mill in Oklahoma Territory, organized the St. Louis and Oklahoma City Railroad in 1895. By 1898 that line connected Sapulpa and Oklahoma City. When Oklahoma City's population more than doubled from 4,151 in 1890 to 10,037 in 1900, the need for housing escalated. To meet the demand John W. Shartel, Anton H. Classen, and others developed residential areas, which resulted in the first urban sprawl. Shartel opened the Florence Addition in 1898, and Classen organized the Highland Parked Addition (now Heritage Hills Historic and Architectural District, NR 79002006) in 1900. In 1902 Classen established the University and Marquette additions. That year Israel M. Putnam organized his real estate enterprise known as the Putnam Company and sold properties in Epworth View, Military Park, Putnam Park, Putnam Heights (now a Historic Preservation District, NR 82003693), Lakeside, and Lakeview Heights. In the 1910s and 1920s Gilbert A. Nichols constructed houses in present historic districts such as Crown Heights Historic District (NR 95001467), Gatewood West and East Historic Districts (NR 04000125 and 04000126), Capitol–Lincoln Terrace Historic District (NR 76001569), and Mesta Park. He is best remembered for the development of Nichols Hills, an exclusive residential area in northwest Oklahoma City. In addition to Overholser's two-story buildings, other multistory structures included a three-story, brick and stone post office building dedicated on July 4, 1890. Construction of the five-story Oklahoma Publishing Company Building (NR 78002249) at 500 North Broadway Avenue began on January 17, 1909. By 1909 six brick and tile manufacturers operated to keep pace with the rapid construction of residences and office buildings. Charles Colcord built the twelve-story Colcord Building (NR 76001571); when completed in 1910, it was considered Oklahoma City's first skyscraper. Oilman William B. Skirvin had the Skirvin Hotel (NR 79002010) built at One Park Avenue in 1910–11. Solomon Layton designed the five-story Baum Building, which was modeled after the Doge's Palace in Venice, Italy, and constructed in 1909–10 at Robinson and Grand avenues. Soon after the land opening settlers established subscription schools until taxes could be assessed to support public schools. After the land run Lyman H. and Martha Newton North opened a subscription school in a tent. Jennie (Mrs. Fred) Sutton established a school in the rear of a hardware store on First Street between Broadway and Robinson avenues. The first official year of public schools in Oklahoma Territory began on January 1, 1891. Oklahoma City received a $60,000 Carnegie grant for a public library which was constructed in 1899. The Draughon's Practical Business and Hill's Business colleges opened in 1903 and 1905, respectively. Construction of Mount St. Mary's Catholic Academy at 2801 South Shartel Avenue was completed in 1904. By 1909 Oklahoma City had ten public school buildings. In 1910 Central High School (NR 76001570) was completed at Northwest Eighth and Robinson streets. By 1930 the city had three high schools, six junior high schools, and fifty-one elementary schools, with a total enrollment of 38,593. The Oklahoma School of Science and Mathematics, a two-year, residential public high school for academically gifted students, graduated its first class in 1992. At the turn of the twenty-first century several Oklahoma City institutions offered higher education: Oklahoma City University (NR 78002247), Oklahoma State University-Oklahoma City Branch, and Oklahoma City Community College. Vocational-technical schools included Francis Tuttle Technology Center/Institute and Metro Technology Centers. In addition to educational facilities, the settlers quickly established churches, many of which have historical significance and are listed in the National Register of Historic Places. For example, the First Methodist Church structure at 131 Northwest Fourth Street was completed in October 1889. Also in 1889 Catholics built St. Joseph's Cathedral (NR 78002253) at the southwest corner of Northwest Fourth Street and Harvey Avenue. Although the Christian congregation met the first Sunday after the land opening, they did not built the First Christian Church (NR 84003383) at 1104 North Robinson Avenue until 1910–11. Seventeen charter members organized the First Baptist Church on November 2, 1889. Their first church, erected in 1890, was razed by fire. Since 1912 the First Baptist Church has been located at Eleventh Street and Robinson Avenue. The Episcopalians first constructed a church circa 1893 at Northwest Second Street, between North Harvey and North Robinson avenues. They later moved to Northwest Fourth Street and Broadway Avenue, and finally to St. Paul's Cathedral at 127 Northwest Seventh Street (NR 77001096). On November 3, 1889, thirty-six charter members organized the First Presbyterian Church, which had several locations before moving to its present site at Northwest Twenty-fifth Street and Western Avenue in 1954. Jews met at various locations until the Temple B'Nai Israel at 50 Broadway Circle was dedicated in January 1908. By 1930 Oklahoma City had 114 houses of worship, and Robinson Avenue was known as "the Avenue of Churches." Initially, the local economy was based on agriculture. Wheat, cotton, and cattle dominated the market. By 1894 farmers supported a corn mill, a grain elevator, a cotton gin, and several grain mills. The Oklahoma Canning Company operated between the months of July and October and was situated on Choctaw Avenue between South Robinson and South Broadway avenues. In 1899 an Oklahoma City Club promotion pamphlet boasted that five to ten thousand bales of cotton were marketed and seventy-five thousand bales were compressed at Oklahoma City. The brochure also stated that the city had thirty-six wholesale houses and twenty-six manufacturers. Around 1909 Colcord, Classen, and others enticed two meat-packing plants to build near the Oklahoma National Stockyards in southwest Oklahoma City. Representative of some of Oklahoma City's early manufacturing firms were the Oklahoma Carriage Manufacturing Company (ca. 1894), Jackson Plow Manufacturing Company (ca. 1894), J. B. Klein Iron and Foundry Company (1909), Boardman Company (1910), Jay Kola (circa 1918), Macklanburg-Duncan Company (1920), and Fred Jones Manufacturing Company (1938). By 1921 fifty-two of the city's seventy-six automobile dealerships were situated along "Automobile Alley," located on North Broadway Avenue between Fourth and Thirteenth streets. Automobile Alley Historic District is listed in the National Register of Historic Places (NR 99000351). A General Motors Assembly Plant operated from 1979 to 2006. At the turn of the twenty-first century the top five employers in the Oklahoma City metropolitan area were the State of Oklahoma, Tinker Air Force Base, the U.S. Postal Service, the University of Oklahoma, and the Oklahoma City Public Schools. Other large employers included the Mike Monroney Aeronautical Center, the City of Oklahoma City, Integris Baptist Medical Center, and the University of Oklahoma Health Sciences Center. The 1920s witnessed further economic development. In 1921 the Traders Compress Company built a cotton compress and warehouse at the intersection of East Reno and Eastern avenues. The last bale of cotton was shipped from this location in November 1969, and the structure was razed in March 1970. On December 4, 1928, the Oklahoma City Number One discovery well (NR 77001095) was completed by the Indian Territory Illuminating Oil Company and the Foster Petroleum Company. On March 26, 1930, the Mary Sudik Number One came in. Both wells were situated southeast of the Oklahoma City limits. On May 27, 1930, the Hall-Briscoe Number One Holmes was completed within the city limits. By 1935 the Oklahoma City oil field had produced 409 million barrels of crude oil, and ninety-five oil industry companies employed twelve thousand. The Capitol sits above an oil pool. In 1941 the Capitol Site Number One (also known as Petunia Number One) was brought in, using directional drilling, on the south plaza of the main entrance. The 1930s were marked by the Great Depression and the subsequent federal New Deal programs, such as the Works Progress Administration (WPA), the Public Works Administration (PWA), and the Civilian Conservation Corps (CCC). As a consequence of the depression, unemployed, migratory persons established a migrant camp in Oklahoma City along the North Canadian River between Byers and Pennsylvania avenues. Local organizations furnished clothing, food, and supplies to the destitute before federal aid became available. Federal programs brought about the construction of the Municipal Auditorium and amphitheaters at several municipal parks. A public art gallery opened January 5, 1936, and the Oklahoma City Symphony Orchestra was initiated under the Federal Music Project of the WPA in 1937. The PWA provided funding for the construction of the Oklahoma City National Guard Armory, which was completed in 1938. 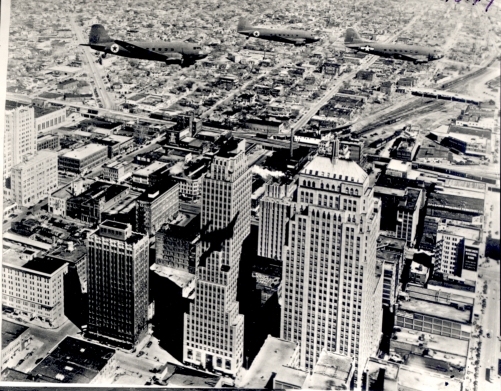 With the advent of World War II the Oklahoma City metropolitan area gained the Midwest City Douglas Aircraft Company Plant. The plant closed in 1945, and the building was designated as Building 3001 at Tinker Air Force Base. Following World War II the Civil Aviation Authority (CAA) Standardization Center moved from Houston, Texas, to form Will Rogers Field in Oklahoma City. When the Federation Aviation Agency (FAA) replaced the CAA in 1958, the installation became known as the FAA Aeronautical Center (now the Mike Monroney Aeronautical Center). Several Oklahoma-based retail businesses have had headquarters or outlets in Oklahoma City. Among them were Anthony Stores, T.G.&Y. Stores, Harold's Stores, and OTASCO. Food distributors have included William E. Davis and Sons and Fleming companies. Troy Smith started the Sonic fast-food chain in 1953 under the name of Top Hat Drive-In. In 1968 William H. Braum opened his first Braum's Ice Cream and Dairy Store in Oklahoma City. In addition, through the years the city has witnessed the development of ethnic business enclaves such as Second Street (Deep Deuce) and the Asian District. Newspapers were Oklahoma City's earliest form of communication. Telephone, radio, and television soon followed. On May 9, 1889, Angelo C. Scott published the first newspaper in Oklahoma City, the Oklahoma City Times. The Daily Oklahoman, begun in 1903, continued to serve citizens as the Oklahoman at the turn of the twenty-first century. The Missouri-Kansas Telephone Company provided service in the 1890s, and by 1909 the Pioneer Telephone and Telegraph Company served the city. Oklahoma City residents heard their first radio program in 1921 and witnessed the first television broadcast on November 10, 1939. At the turn of the twenty-first century SBC Communications (formerly Southwestern Bell) and Cox Communications offered telephone and Internet services. The three major local television stations were KFOR (channel 4), KOCO (channel 5), and KWTV (channel 9). In addition to the Oklahoman, the Journal Record and various ethnic papers, such as the Black Chronicles, the Oklahoma Chinese Times, and El National, have served the public. Several events in Oklahoma City gained national attention. The Urschel kidnapping occurred on July 22, 1933, when George "Machine Gun" Kelly and his accomplice Albert L. Bates abducted prominent Oklahoma City resident Charles F. Urschel and his guest Walter Jarrett. On July 5, 1982, the Penn Square Bank was declared insolvent, causing other banks across the nation to close and resulting in the revision of banking laws. In April 1995 the Alfred P. Murrah Federal Building was destroyed by an ammonium nitrate–fuel oil bomb, which killed 168 people and injured approximately 850. The early railroads sustained communities until good roads could be built. The first railroad constructed through present Oklahoma City was the Southern Kansas Railway (later the Atchison, Topeka and Santa Fe Railway) in 1887. Between 1890 and 1895 the Choctaw, Oklahoma and Gulf Railroad (later the Chicago, Rock Island and Pacific Railroad) built a line that connected Oklahoma City to El Reno and McAlester. In 1898 the St. Louis and Oklahoma City Railroad (later the St. Louis and San Francisco Railroad, SL&SF) joined Sapulpa and Oklahoma City. Between 1902 and 1903 the Missouri, Kansas and Oklahoma Railroad (later the Missouri, Kansas and Texas Railroad) built a line between Oklahoma City and Agra in Lincoln County. That company also constructed a line from Coalgate to Oklahoma City in 1903–04. Between 1901 and 1902 the Oklahoma City and Western Railroad Company (later the SL&SF) built a line from Oklahoma City to Chickasha. By 1916 the interurban, operated by the Oklahoma Railway Company, radiated from Oklahoma City to Moore and Norman to the south, to Edmond and Guthrie to the north, and to El Reno to the west. In 1916, one year after the Oklahoma City Model-T Ford assembly plant began operation, the number of automobiles outnumbered horses. Braniff International Airways had its start in Oklahoma City in 1928, and Central Airlines began operations in 1949. In the early 1940s three airlines (American, Braniff, and Continental) and ten bus lines served the city. At the turn of the twenty-first century commuters used the Lake Hefner Parkway, John Kilpatrick Turnpike, Broadway Extension, Northwest Expressway, and Centennial Expressway to reach their work destinations. Interstate Highways 35, 40, 44, 235, and 240 and U.S. Highways 62, 77, 270, and 277 provided access through the Oklahoma City metropolitan area. Will Rogers World Airport and Wiley Post Airport accommodated air travelers. Since June 1999 the Oklahoma Spirit Trolleys, part of Oklahoma City's mass transit system, have furnished shuttle service from the Interstate 40/Meridian Avenue hotel and restaurant district to downtown and Bricktown. Oklahoma City has experienced continual population growth. At 1907 statehood the city had 32,452 citizens. The numbers almost doubled by 1910 with 64,205 reported and rose to 91,295 in 1920. In 1930 the census indicated 185,389 residents. The population climbed to 204,424 and 243,504 in 1940 and 1950, respectively. Numbers increased to 324,253 in 1960, 368,164 in 1970, 404,255 in 1980, and 444,719 in 1990. At the turn of the twenty-first century Oklahoma City had 506,132 residents, of whom 68.2 percent were white, 15.1 percent African American, 10 percent Hispanic, 3.4 percent Asian, and 3.3 percent American Indian. The U.S. Census of 2010 counted 579,999 Oklahoma City residents. Oklahoma City offers numerous attractions such as the Oklahoma History Center, the National Cowboy and Western Heritage Museum, the Oklahoma City National Memorial Center, the Oklahoma City Museum of Art, Science Museum Oklahoma, the National Softball Hall of Fame, the Forty-fifth Infantry Division Museum, and the Oklahoma City Zoological Park. Bricktown in downtown Oklahoma City is the venue for a movie theater, restaurants, retail shops, and business offices. The Cox Convention Center, Chesapeake Energy Arena, and the Chickasaw Bricktown Ballpark provide locales for sporting and other recreational events. At the turn of the twenty-first century Oklahoma City had a council-manager form of city government. Odie B. Faulk, Laura E. Faulk, and Bob L. Blackburn, Oklahoma City: A Centennial Portrait (Northridge, Calif.: Windsor Publications, 1988). "Oklahoma City," Vertical File, Research Division, Oklahoma Historical Society, Oklahoma City. Angelo C. Scott, The Story of Oklahoma City (Oklahoma City, Okla.: Times-Journal Publishing Co., 1939). Roy P. Stewart, Born Grown: An Oklahoma City History (Oklahoma City, Okla.: Fidelity Bank, 1974). Susan Wallace and Tamara J. Hermen, Oklahoma City: A Better Living, A Better Life (Montgomery, Ala.: Community Communications, 1997). Pendleton Woods, "Oklahoma City Metropolitan Area," in Cities of Oklahoma, ed. John W. Morris (Oklahoma City: Oklahoma Historical Society, 1979). Linda D. Wilson, "Oklahoma City," The Encyclopedia of Oklahoma History and Culture, https://www.okhistory.org/publications/enc/entry.php?entry=OK025.